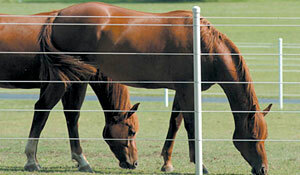 Tornado equestrian fencing is trusted by thousands of horse owners whose priority is the security of their animals. 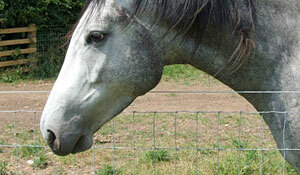 We offer a choice of equine products to suit different environments and budgets, all designed by specialists to meet the very specific requirements of high-quality, horse-friendly wire fencing. The unique, close wire spacing of both the stay and line wires ensures optimum levels of strength and resilience to impact. 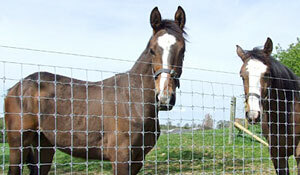 The elasticity of Tornado Horse fence allows it to flex under the horses’ pressure and return to its original shape, with no compromise to stability. Our fencing is exhaustively tested and every roll is given a unique serial number to ensure complete traceability. We ensure timely and efficient delivery with our own fleet of distribution vehicles. Finally, our support services last as long as your fence: contact us at any time for assistance or advice. Tornado is a member of BETA, the British Equestrian Trade Association. 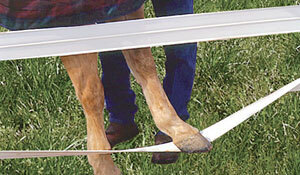 CenFlex™ HTP® is a lighter alternative to the traditional Centaur HTP®. It utilises the same cross-linked polymer technology and is ideal for use in areas of reduced pressure or when fencing on a budget. Centaur HTP® and Centaur HTP Hot-Rail are the strongest rail systems on the market and are manufactured using three high tensile wires embedded in a 125mm wide, cross-linked polymer coated rail, creating unparalleled strength and flexibility. Centaur Lightning® is permanent electric fencing that incorporates highly visible white or brown polymer and exclusive conductive black polymer in three safety-shock points for 360 degree containment. 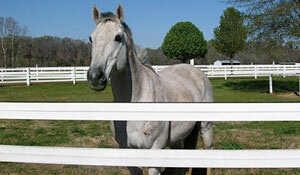 Tornado’s Classic Horse Fencing is renowned in equestrian circles for providing the most cost-effective way of protecting horses from escape and excluding other animals. Tornado’s Premium Horse Fencing uses the same high-quality Hi-Tensile Plus wire as the Classic version but with a Tornado Titan joint construction for extra rigidity, making it suitable for the most extreme conditions.